All interested parties are invited to comment on the latest exposure draft on the changes to the Uniform Accountancy Act and its Model Rules concerning CPA firm names. The joint AICPA/NASBA changes were approved for distribution by the NASBA Board of Directors in October and by the AICPA Board of Directors in November. 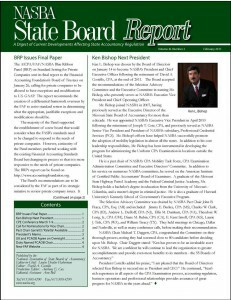 The document can be found in the “news” section of www.nasba.org and comments are requested by Friday, March 4, 2011. The proposed changes to the UAA would add definitions of “Network” and “Network Firm.” The Model Rules changes would further clarify those definitions, delete any mention of “fictitious” CPA firm names, and scope out what is and is not a misleading firm name. A comment to the Rules has also been proposed which underscores that in determining whether a CPA firm name is misleading, the Board recognizes that it is the policy of this State to promote interstate mobility for CPAs and CPA firms which employ them, and shall also consider the basis for approval of the same CPA firm name by another state’s Board of Accountancy.